I believe in the open source model, of sharing ideas to provoke thought about the issues facing Metro Detroit. I've even promoted the idea of a "Policy Prize" conference that brings together the nonprofits and neighborhood development groups of this region and allows people to vote on creative ideas to revive the Detroit region. Today, I'm sharing one of my flow charts as food for thought. I'm not a lawyer, and I'm not an expert on land use or really comparative forms of real estate ownership. 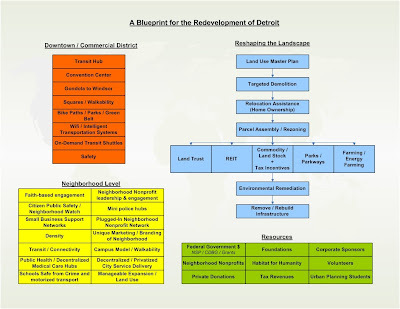 But I put what I did know on paper for others in the hopes that it will help create that actionable plan to address abandonment and environmental degradation in Detroit. As you know, the "right-sizing" of Detroit has received a lot of press attention lately. Some of the more notable articles have appeared in the Economist, New York Times, ABC News and other sources. Today, in Crain's (subscription needed), there was an article about nonprofit and community groups desiring a greater role in reshaping Detroit. There have been a few conferences on this topic as well, most notably last week at Wayne State. In general, Bing needs to present an open source, plug-in model for every group to get involved and provide value to a larger plan for the city. 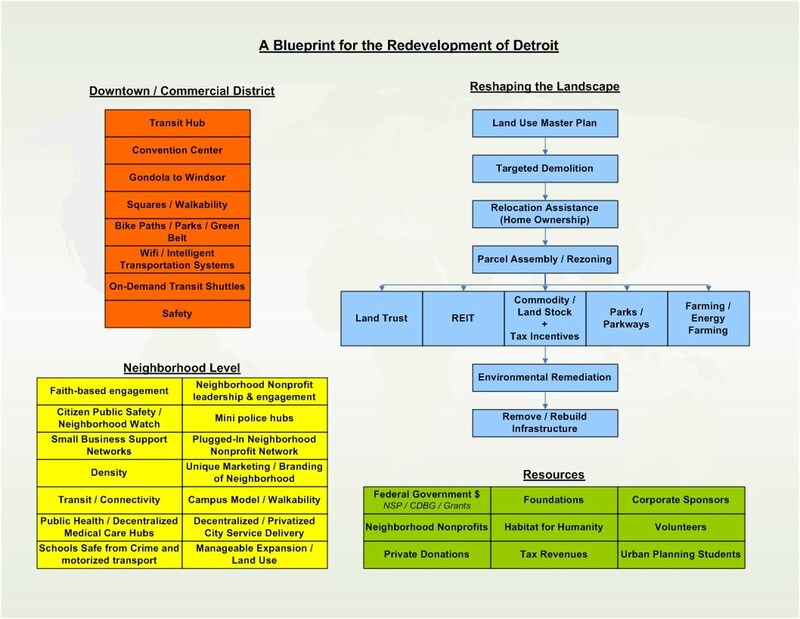 Our region has a tremendous opportunity, but the Mayor needs to present that A to Z, actionable plan and show how all groups - government, nonprofits, corporate sponsors, foundations, neighborhood groups - can be a part of the reshaping of Detroit. I know that is difficult to do with so many stakeholders and so many people to please, but it isn't impossible. It will take bold leadership, human talent, venture capital, creative legal mechanisms, unique branding and marketing, and ample room for public input. "Bing needs to present an open source, plug-in model for every group to get involved and provide value ... the Mayor needs to present that A to Z, actionable plan"
Not sure whether I'm just misreading you or have a minor quibble - I think a major benefit of having an open (source) model is /not/ having to present the complete, A-to-Z plan. To best leverage creativity through an open process, provide a lightweight framework, defined overall goals, and access to tools, but not a specified plan of action, so that implementing partners can determine how best to address a particular need in a particular area. Challenge: setting the right rules so as to allow creativity and flexibility, while maintaining enough oversight and public input to ensure the implementation is in the right direction. I see what you are saying Murph. I think there needs to be an end vision and a framework/model where many parties can "plug in" to creating the end product. I think when I say open source, I think of small neighborhood groups using open resources and tools to define their own geographic area. So the planning isn't so top down, but more ground up.